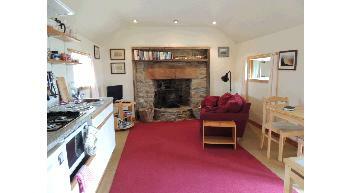 A trip round Old Point - from the fireplace via the dining area, through the sea door, the cosy bed with the bathroom door to the left, the galley kitchen and back to the fireplace. 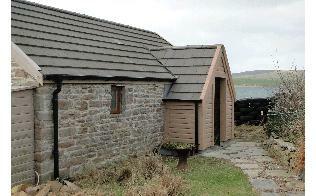 Old Point is a fully modernised one roomed stone built sea cottage. It has a built in box bed, a galley kitchen and a wood burning stove. Although compact, it has all the amenities needed. Gas hob and multifunction microwave oven. Fridge with a small freezer compartment. Cooking pans and appropriate utensils. Dining table, crockery and cutlery. The separate shower room has an electric shower, wash hand basin, shaver socket and, of course, the loo! Curtained off in its own recess is a very cosy traditional Orkney box bed (4'x6'2") with storage beneath. Bedding provided (sheets, pillowcases and duvet.) Towels are available on request. Television with Freeview and DVD playback. Woodburning stove with some fuel provided, then logs available for £6.30/bag. 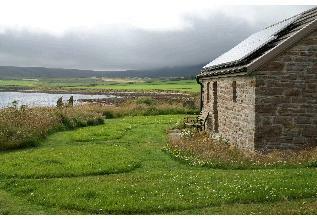 There is underfloor heating (from a ground source heat pump) Electricity is included in the rental price. Be at one with the elements - sun, wind and rain - sunsets and sunrises. Calm still magical days or fantastic energetic wind and rain. Awesome whatever. Soft landscapes, blue seas and green hills, skies ever changing..